I have spent the last few days busily reading a wonderful book. 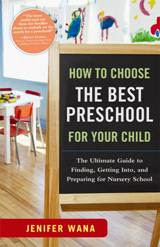 A reader sent me a book called, "How to Choose the Best Preschool For Your Child," by Jenifer Wana. Before I continue I want to let you know that I was in no way compensated for my review of this book. So what did I think of the book? WOW! Ms. Wana has included every possible scenario that a new parent searching for a preschool may encounter. I don't think I have read a more thorough book in my life. She has examples of different kinds of preschools with details of each. From there she helps parents get organized for their journey to preschool. She starts at the list phase of preschool and takes parents up to the first day they drop their children off at the new school. I believe that Ms. Wana has not missed one small detail with the writing of this book. If a parent has ever had any ponderings about how to choose a preschool for their child this book should be the first place you can send them. It answers every question I could think of and more. The book was also easy to read and well laid out, making the process of finding a nursery school understandable and not so scary. I believe she did a wonderful job. There is just one small point that I took "issue" with. It is an extremely small and possible unimportant part, but being a parent in the situation I have a different point of view. Ms. Wana talks about "redshirting" children--a new term to me. This is the practice of waiting to send children on if they seem too young. First I didn't like the term, "redshirting," but my husband had no problem with it. Second, this is such a difficult decision for parents. I fretted over this decision for 6 months. Ms. Wana states that "redshirting doesn't give children any practical advantage or improve their school success in the long term." This may be true, but when your child spends the last three months of school being frustrated and unhappy, this is one thing you may want to look at. For me holding my son was one of the hardest, but best, decisions of my life. The following year of school was just fantastic for him. He was a leader in the class, helpful with all tasks, and confident. He ended the year winning the Principal's Award for his class. He is happy, I am happy. If this situation does arise for you, make sure you look at every possible scenario. Maybe it will be fine to send your child on to the next level. On the other hand it may be just as wonderful for them to wait to move on. In conclusion, I would recommend this book to any parent in a second. I believe that it is an invaluable resource for those that are entering the world of preschool. Many parents are surprised at how the preschool process works. After reading this book, a parent will know every nook and cranny of looking at and finding the right preschool for their child. Thanks Ms. Jenifer Wana for taking the time and using your talents to put together such a comprehensive book for parents.